The team was holding a rookie seminar at Dodger Stadium, and Snider, although ailing and confined to a wheelchair, traveled from San Diego to talk to the kids. "You have to learn to hate Halloween," he told the wide-eyed youngsters. One of them had the nerve to ask why. Miss you Duke. 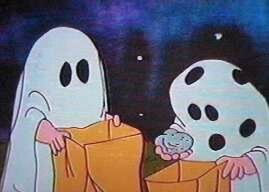 A rock in every Giant fan kids bag in your memory. Yes, Charlie Brown is a Giants fan. Evidence provided below. Peanuts creator Charles Shultz, a Santa Rosa resident, was a big Giants fan. Take a look at this Peanuts comic strip from 1962, after the Giants lost the World Series. So that means that Charlie Brown had to wait another 48 years before the Giants finally won a World Series, meaning that he's about 59-60 years old today. I thought one of those yahoos tearing up the City by the Bay last year looked a bit familiar. 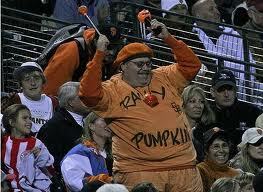 I'm pretty sure he's the Rally Pumpkin. In the spirit of Halloween. Here's one of my favorite YouTube videos. My apologies to the Doobie Brothers. With the Cardinals championship run now officially over, it’s time to light up the hot stove. There are 128 days until spring training begins, and roughly a little over a month before we know the outcome of Frank McCourt remaining as owner. What all this means is that I find it to be rather unlikely that the Dodgers make any major moves due to the uncertainty of the current ownership situation, for the third year in a row. What the Dodgers do have now is 4 days to negotiate with any of their own free agents before they are tossed into the open market for all takers. There are ten players that the Dodgers have an exclusive window of time to negotiate a new contract with. I list them below with my take on what they will do. What do you think? 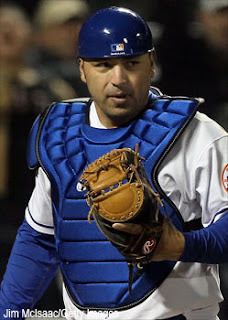 Colletti has already hinted in the press that he will pass on Rod and go with Ellis and Fedex behind the plate. That’s sad for Rod because he loves being a Dodger. I wish him the best and hope he doesn’t come back to play against us and rake. The serious neck condition seems to have forced Blake into retirement. If he agrees to return and is willing to take a serious pay cut on an incentive laden contract, he may play again, but as a Dodger, I doubt it. Its sad to see Casey go. He brought great chemistry and is liked and respected by his teammates and the fans. Good luck Casey, I hope you latch on with an American League club and get some decent playing time. Big Jon will never be the flame thrower that he once was. his agent has even said so. What that means is that he needs to reinvent himself as a pitcher. Honestly, I don’t see that ability in his mental makeup. I could be wrong, but all indications in Brox’s career have shown otherwise. I believe he signs an incentive laden contract and that the Dodgers will offer him one. Whether he agrees to that type of situation, I don’t know. He may just go the way of Eric Gagne and try his luck elsewhere, perhaps Atlanta, near his home. This is a difficult decision. Jamey will be 38 years old by Spring Training. As gritty and hard working as he is, how long will he continue to produce and be a valuable asset to the club? I believe an effort will be made to sign him. The question is, will Carroll want to return to the Dodgers? His career is coming to an end. Will he want to move on to a contender in a utility role in a last ditch effort to get a Championship ring? I think he goes elsewhere. 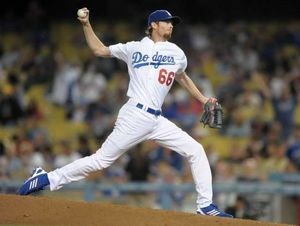 I like Garland and I was hopeful that 2011 would be a great year for him in Dodger blue. Unfortunately, he hit the D.L. for the first time in his career. He won’t be offered a deal with the Dodgers and I see him signing an incentive laden deal elsewhere. An offer will be made to Hiroki. It will be another 1 year deal, probably for around the same amount. Will family commitments force him back to Japan? I believe so. He tended to hint he was going in that direction at the end of the season, based on the “good byes” he was saying to teammates in the last week. I hope I’m wrong. Kuroda is a solid starter and one of the anchors to the starting staff. 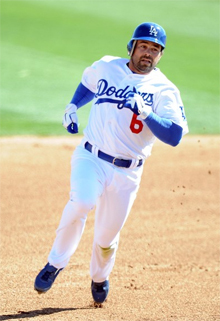 If he doesn’t return, the Dodgers have a huge hole to fill. I have no idea what Colletti’s position is with Mike. 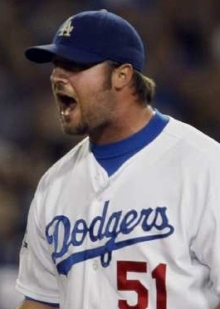 I believe that the Dodgers have plenty of relievers in the minors that could potentially take McDougal’s spot on the roster. If he walks, I don’t see this as a big loss. I think they’ll offer him a deal. I overheard Miles speaking with close friends in the stands at San Francisco before a game in September. He was telling them that Mattingly is happy with him and that he believes he’ll be back in L.A. for next year. That must mean that if he’s offered something fairly respectable, he’ll take it. If it were up to me, I’d allow him to go elsewhere. I won't say "let him walk” because we all know that Miles never walks...that’s my problem with him, his on-base percentage. I’d much rather see him in a Giants or DBacks uniform. Padilla’s injury history is troubling. He’s too risky. He won’t be offered a deal by the Dodgers. Thanks for the 2009 playoff victories against St. Louis and Philly, Vicente. The soap bubble goes elsewhere. Sadly, due to the ownership uncertainty and the Dodgers precarious financial position, this may be the largest free agent deal offered by the team this off season. 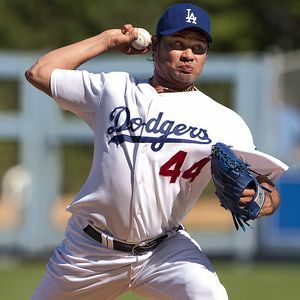 Rivera had a great second half and was a key contributor, but he simply isn’t the marquee player that the Dodgers need to make a splash in off-season moves. I hope he doesn't get big money because Rivera is ant a "Big Money" free agent. Don't be foolish, Ned. So my final tally is two. I believe the Dodgers re-sign Miles and Rivera. If it were my decision they would not sign Miles, and instead they keep Carroll for one last year. Then they sign Rivera and Kuroda. Losing Kuroda will be a major loss. In my opinion, Kuroda should be Colletti’s primary focus for the next four days. It’s game six in St.Louis and the Cardinals are in the exact same situation that the 1978 Dodgers were in, returning home for game six being down 3 games to 2. We had the Yankees in ’78. We had the Steinbrenner Free Agency Freaks. A store bought team, hmmm, much like today’s New York Yankees. 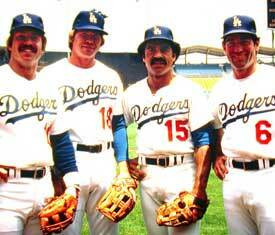 We had ‘em, 2 games to nothing, taking the first two in L.A., backed by inspired play of Davey Lopes. Lopes blasted two homers out of the park and playing with a heavy heart as he dedicated the Series to Jim Gilliam, who had died the week before. Then in Game 2 we had 'em behind the heroics of Bob Welch, who closed out game two with an inspirational strikeout of Reggie Jackson to put the Big Blue Wrecking Crew up two games to nothing on the defending champs. Jackson k's against Welch. 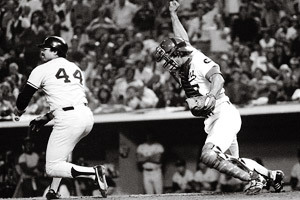 Steve Yeager celebrates. We had 'em in game three, and then Graig Nettles started committing larceny down the third base line. Robbing Garvey in the 5th and Lopes in the 6th. Both times with two men on base and two outs. We had ‘em in game four. Up by two runs in the 6th, when Reggie Jackson decided to stick his derriere into a throw that was going to result in an inning ending double play. When Frank Pulli decided to hose the L.A. squad by not calling interference on the play. Jackson, Mr. Cheating October was instrumental in turning the tide of the series. The Dodgers, in control of game 4, would have taken a 3-1 lead in the series had they taken that game. Judge for yourself in this shaky youtube clip below. We had ‘em, going into game six, even though we were down 3 games to 2 because we were coming back to L.A. for the final two. No way that New York team was coming back to celebrate in our house. We had ‘em and we were gonna shove it up Homer Howard Cosell’s snozzola and watch him weep on National TV, having to force himself to admit that the Dodgers, the LOS ANGELES Dodgers were going to be the World Champions. Okay, I know, NBC had the ’78 Series, but we had to stomach Cosell in ’77 and ’81. So I’m off on this point, but I couldn’t stand Cosell and his Yankee grandstanding and obvious bias at ABC. And then it happened. Brian Doyle. The Red Sox in ’78 wince about Bucky Bleeping Dent. Dodger fans in ’78 groan over Brian Bleeping Doyle. Doyle, a lifetime .161 hitter entered the World Series coming out of the best season of his career where he hit a whopping .192. He must have had Don Sutton shaking in his spikes because Don took his third loss in the series that night. 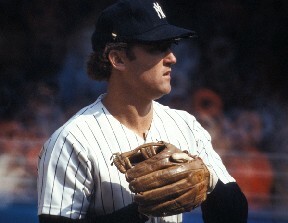 Doyle in his career, which spanned parts of 4 seasons in the majors, had a total of three extra base hits in his life, but in game six of the ’78 series, being forced to start due to an injury to Willie Randolph, he proceeded to wrap out 3 hits, including a double, to spark the Yankees to victory. My brother, Eric, actually had tickets to Game 7 of the Series. And he was going to take me. It was going to be a surprise. He didn’t have the heart to tell me about it until 25 years later. For that reason, I state that 25 years after this series was over, my heart was broken again. I guess my brother felt that I’d eventually have the maturity to accept that fate, a full quarter of a century later. Well, he was wrong! Brian Bleeping Doyle! Brian BLEEPING DOYLE!!! BRIAN BLEEPING DOYLE!!!!!! I want to go to that baseball camp of his in Lakeland, Florida and tear it down. I wanna tell all his students that they are taking hitting lessons from a .161 lifetime hitter and tell them to go to their parents and demand a refund. Yeah, that'd make me feel better. We’d order the teams well before Christmas, and they’d arrive in early January. Fresh white pristine cards. We’d go through them and check out the player ratings in fielding, throwing arms, defensive ranks, speed, stealing ratings. We’d review the cards, always on the Advanced game version. The basic game was for wimps. Sometimes we’d disagree with the ratings certain players were given by the game inventor, a true genious by the name of Hal Richman. But we went with Richman’s Strat-0-Matic ratings because, in the end, the inventor of the game was the ultimate arbitrator. Strat-o-matic. A computer based card game, invented in the 1960s was about as close you could get to managing the real teams. 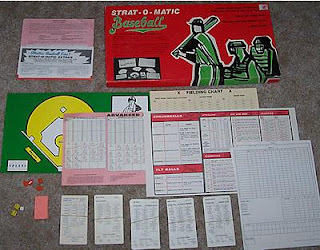 In fact, it is because of Strat-O-Matic that I truly believe that I could strategize with any manager in the game. 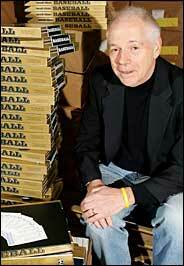 The inventor, Hal Richman, gets little credit for being the first, well respected, sabermetrician out there. He was way ahead of his time. Richman, a 1958 Bucknell university graduate in mathematics had invented the concept of the game as a young boy in 1948. He was a Yankee fan, who idolized Joe DiMaggio and had an absolute love for baseball, the aura of statistics and strategy. By 1960 he had created the game. 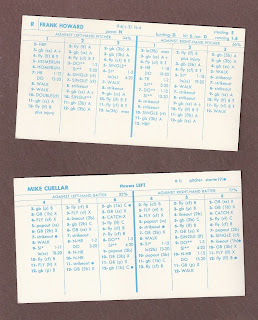 Cards for each baseball player in the league were developed. Players were rated through the extense research of Richman, who followed the game religiously and read periodicals from every market in the country to get a true feel for a players ability in all the tools. Hitting, hitting for power, speed running the bases, speed with regard to stealing bases, pitcher longevity, bunting ability, hit and run ability, and so much more. Heck, Richman even put a mechanism in the game where a player could get injured and be forced to sit him out for weeks at a time. Richman would create the cards for each player between October and December of each year for distribution for the new year, based on the previous year’s stats. Hal stated in interviews that he’d work 80+ hour weeks just producing the full set of players cards for two full months to get the new season’s sets out in time. In the photo above is a sample of two real life Strat-O-matic cards. 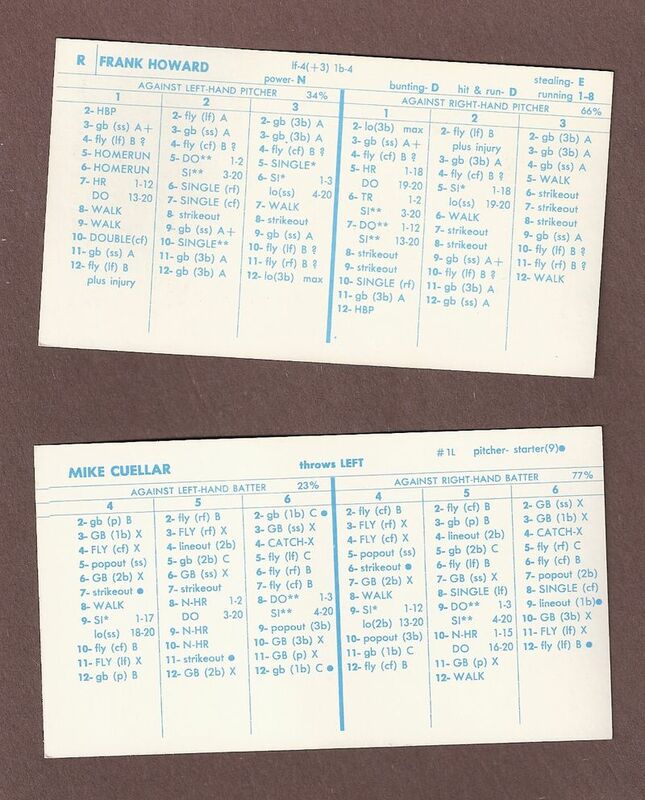 They are the1971 Frank Howard and 1971 Mike Cuellar cards. The concept of the game was simple. 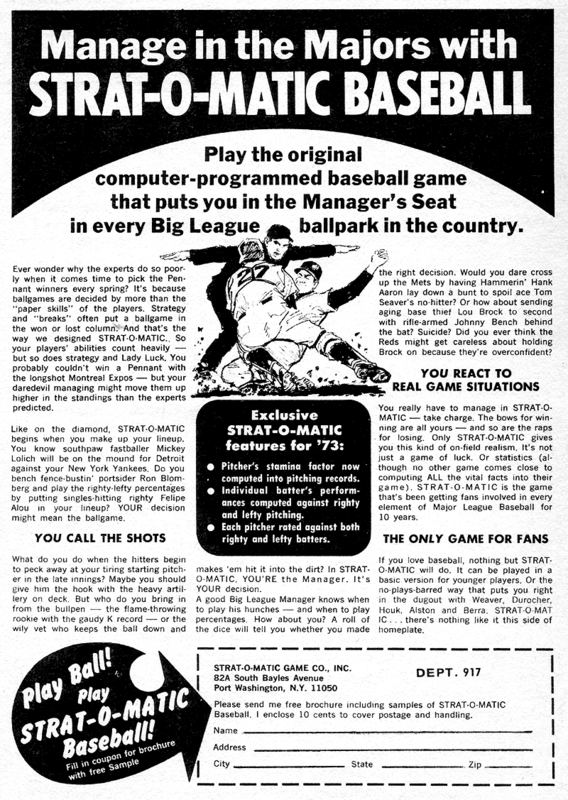 The players of Strat-O-Matic baseball serve as managers of each team. In this case the Washington Senators and Baltimore Orioles. You would prepare your line up and face off for a nine inning game. The offensive side would have three dice. One red and two white. You roll the red die and come up with a number, 1 through 6. That number would represent a column on one of the cards. In this case, Frank Howard, a right handed batter is facing Cuellar, a left handed pitcher. If you rolled a 1, 2, or 3, you would look at the the offensive players card. If you rolled a 4, 5, or 6, you look at a column on the pitchers card. So, as an example, if I rolled a “1,” I’m looking at the column under “1” on the far left, because Cuellar is a lefty. (If he was facing Jim Palmer, a righty, you’d look at the “1” column towards the right center of the card, which corresponds to when Howard was facing a right handed pitcher. The next step is the manager of the offensive team rolls the two white dice and adds up their total. So if, for example, I rolled a “5” and a “3,” their total being “8,” Frank Howard has just walked. That is the gist of the game. You will note that there are ratings on each card for Howard’s ability to bunt, hit and run, steal, run the bases, his power rating. Additionally there are references to his fielding rating in Left Field and first base, his defensive positions, as well as his throwing arm. I assure you, Howard’s ratings in each of those areas with the exception of power are about as bad as you could get on a Strat-O-Matic card. Likewise, you’ll notice that with Cuellar, 1971 was a fine year for him and he had a lot of complete games. His card indicates that as a starter, he wouldn’t tire significantly until the 9th inning. Anything on his card with a black dot next to it would become a single if it happened in the 9th inning or later. As the years went by and the popularity of the game grew, eventually today’s MLBPA organization has re-negotiated the licensing agreement through teams of lawyers and the game has gone by way of the internet. I must admit, I’m not familiar with the internet version of the game and I haven’t played a game of Strat since the mid 90’s when I briefly introduced it to my sons. It was my brother Taylor that first spotted the game. I think it was in a Sporting News ad. Taylor, a true stat-geek, ordered the Strat-O-Matic cards with his earnings from making hero sandwiches at his first job, Senada’s Deli and Bakery in Hacienda Hts. I owe it to him for turning us all on to “Strat” as we called it. The first season we played was 1971. We divided up the teams and Taylor was kind enough to allow me to manage the Dodgers. Year after year we continued. And the participants in our league grew. 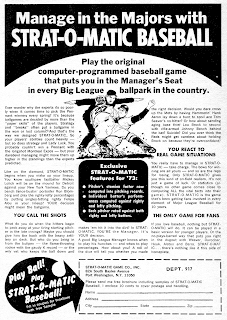 This Strat-O-Matic Baseball ad from 1973 was probably similar to the one that my brother, Taylor, spotted when he ordered the game in 1971. Attempts were made to play the full season, but it was nearly impossible. I suppose it could have been done if we didn’t keep stats. But what good would that have been had we not kept stats? That was the whole purpose of the game. Keeping records. I learned how to use a slide rule while recording slugging %’s and ERA’s. Summer vacations were spent playing the game for hours on end, deep into the night. By year two, our participants in our Strat League were Mike S., Jeff, Richard, Brad, Bill, David, Clark, Marvin, Jon, Mike T. and a few others. Some stuck with our full blown league. Others just dropped by and played a game once in a while. During one vacation shared with 4 close families, the boys spent the entire week playing baseball in the day and Strat at night. It was a dream week in San Diego and later the next year at Lake Elsinore. True baseball nirvana. There was Strat “etiquette” too. This was in reference to proper decorum while playing the game. It meant there was no gloating, no showboating. If you did well, you were allowed a brief moment of jubilation. A exclamation of “Yes!” or a short clap or fist pump. But that was it. Anything beyond that and you’d get punched in the arm. Yes, we had our share of Strat-O-Matic brawls. Like the time my ’73 Dodgers won the Start-O-Matic World Series against my brother’s Minnesota Twins. With the last roll of the dice and the victory at hand, Taylor grabbed the die and said “That doesn’t count, that was practice.” and proceeded to roll the dice again. After that, it was on. Two Strat-O-Matic fanatics rolling around on the floor in a brawl reminiscent of a Dodgers-Giants melee. It wasn’t until another sibling came in to break it up amongst a lot of laughter between the two of them that order was restored. 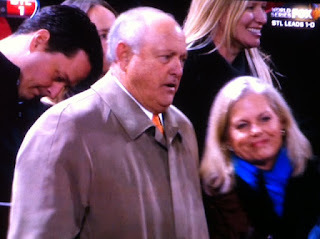 I wasn’t laughing though, nobody was going to cheat me out of my World Series victory. We forced one of our players, David, to roll the dice from a Yahtzee cup. It turns out that there were accusations of cheating where he’d roll the dice in a certain way that would reduce the chances of it spinning horizontally and coming up with an unfavorable number. Then there was my younger brother, Richard, who we forced into the league out of the need for an additional player. Rich didn’t have much interest in the game at all and it was always tough to get him to participate with any concern or desire to win. One summer night my brother Taylor was literally shaking him to keep him awake late at night to roll the dice so he could finish up a game. Our mother wasn’t too pleased when she walked in and witnessed that event. The game was shut down for the night. Strat was a way of life in our household, and as we grew up and went away to college, eventually, life moved us away from the game. The end of Start-O-Matic was a sense of realism that my childhood had come and gone . I was a 21 year old, and I attempted to play out the season with cards from the 1981 season by myself. It wasn’t fun without the comraderie and competition of my brother and friends. It was the last year that I ordered teams. Now, years later, as I encounter some of my old strat-o-matic playing buddies, we reminisce and laugh about those times. We laugh about strategies we used. Also the creative managing that we believe should be used in today's game, i.e., putting a left handed reliever in to face a lefty, move him to rightfield for a hitter to keep him in the game and then return him to the mound for the next batter. Why in the world has that hasn’t been done in today’s game, with the paranoia managers today have with the lefty-lefty and righty-righty matchups, I’ll never know. There is a push for Hal Richman to be inducted into the baseball hall of fame, just as Bill James was. This past March, he was inducted into the National Jewish Sports Hall of Fame, an honor that deeply touched the 75-year old baseball genius. Generations of baseball fans learned the game through Richman’s board game. As a missionary in Argentina, somehow one of the fellow missionaries working with me mentioned Strat-O-Matic in a conversation. From then on, we were best friends. At a Dodger game in the 70's, while sitting in the Left Field Pavilion, a guy several rows behind us was heckling Lou Brock and called him out as a “4” with a +3 throwing arm (both very poor defensive ratings in Strat-O-Matic). From that moment on, we were buddies the rest of the game. Doug Glanville, a Strat-O-Matic player, protested that the game ranked his defense too low. When Lenny Dykstra mentioned he played Strat-O-Matic in a post game interview, he earned my instant respect. So did Spike Lee, Billy Crystal, Doug Glanville, and Keith Hernandez. 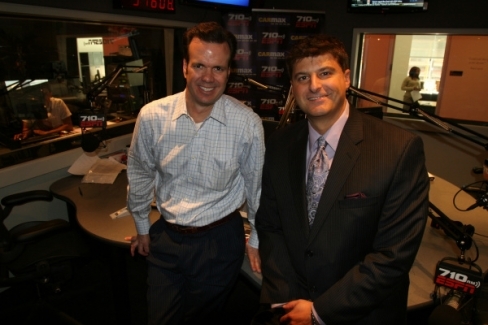 And Mike Smith, the current Clippers announcer, former Celtic, BYU All American. Why do I mention Mike? Well he’s Mike S., the guy I mentioned as part of our original Strat League in the early to mid 70s. LOS ANGELES – The Los Angeles Dodgers are lowering pricing and adding new benefits for season ticket holders in the Field, Loge, Club, Reserve, Left Field Pavilion, Right Field Pavilion and Top Deck sections of the stadium for the 2012 season. Dodger season tickets remain one of the best values in Los Angeles and all of sports. Lower pricing and related benefits will be available for 96% of the seats in Dodger Stadium. More than 35,000 seats will be available for $20 or less on a season ticket basis. The Dodgers currently offer one of the lowest entry points in all of Major League Baseball for season ticket holders at $5 per seat. The $5 Top Deck option reflects pricing that was in place two decades ago. The $16 Preferred Field Box offering is the lowest in 10 years, the $10 Preferred Loge Box plan is the lowest in 16 years and the $6 Reserve option is the lowest in 24 years. Several exciting new benefits will be offered in 2012 adding exceptional value to being a Dodger season ticket holder including the opportunity to enter the stadium one hour before the general public to watch Dodger batting practice. Season ticket holders will also be able to play catch on the field with friends and family after select games. Additional amenities include access to all levels of the ballpark, from the Top Deck to the Field level. MVP and VIP Field Level season ticket holders will also receive a complimentary Stadium Club membership to use throughout the season. Complete details on new pricing and enhanced benefits for the 2012 season exclusive to season seat holders can be found by visiting www.dodgers.com/seasontickets. Interesting that Licey has Sands hitting third in the lineup in the first four games. Hopefully Jerry is enjoying the atmosphere in the Dominican. One thing I love about the Dominican League is that it is an intense atmosphere. An ideal training ground to see if a player can handle pressure in a competitive league with knowledgeable fans. Four RBI in 4 games for Jerry including a double and homer, not too bad a start. And if you perform well, they LOVE you. 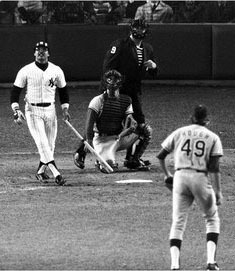 Now that Albert Pujols has matched Reggie Jackson’s 1977 feat with three home runs, will we see a little bit less of this? 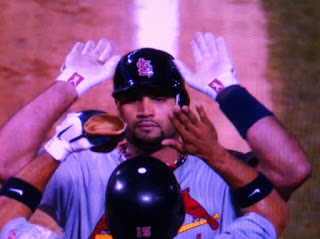 What an amazing player Pujols is. 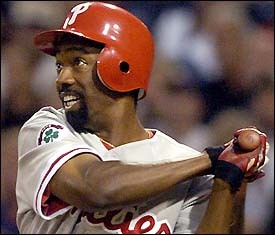 He is easily the most feared hitter in the game. Could you imagine what Kemp would do if he was hitting in the third spot just in front of Albert Pujols batting cleanup? Then again, think of this. 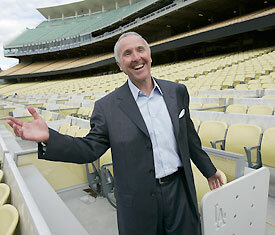 Frank McCourt is absolutely the least popular man in Los Angeles. If he was somehow able to land Pujols, that unpopularity just may soon go away. 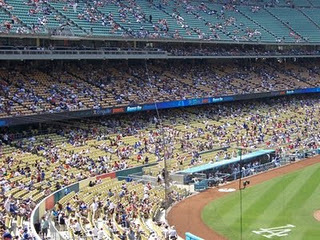 Season tickets sales would rejuvenate and the attitude towards the Dodgers, their management and present ownership would take a 180 degree turn. I can't possibly see how he could do it, but in the back of McCourt's mind, perhaps he sees this as his only way to be forgiven by the Dodger fan base and ultimately keep the franchise. If he could miraculously pull it off...that would be quite a story. In fact, it would be THE STORY of the off-season. Tonight’s World Series matchup between the Rangers and Cardinals was a throwback to the 60’s. A 2-1 affair that was a pitching duel extraodinaire. Every at bat intense. As the game progressed, each pitch more riveting. Fans clinging to the edge of their seats. A real nail biter in the brisk autumn air. 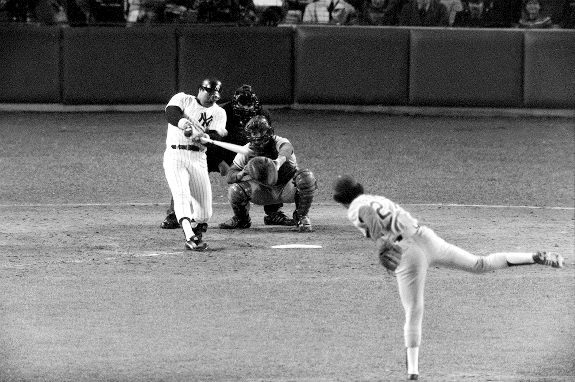 Reminiscent of Welch vs. Reggie, Palmer vs. Koufax, Gibson vs. McClain, Brooks sacrificing his body to make plays, El Tiante vs. the Big Red Machine, Clemente bouncing around the base paths against the defending Champ O’s, Graig Nettles defensive gems crushing Dodger hearts and turning the series around, Fergie throwing out Bando. It was good old National League style baseball in an N.L. park. No D.H., no waiting for the 3-run homer. It was a game where you needed to move the runner over or put on a "run and hit." A contest where Pujols missed hitting one out by an eye lash, where Andrus and Kinsler flashed the leather more than once to save a run and the starters brought their “A” game on the biggest stage of the year. 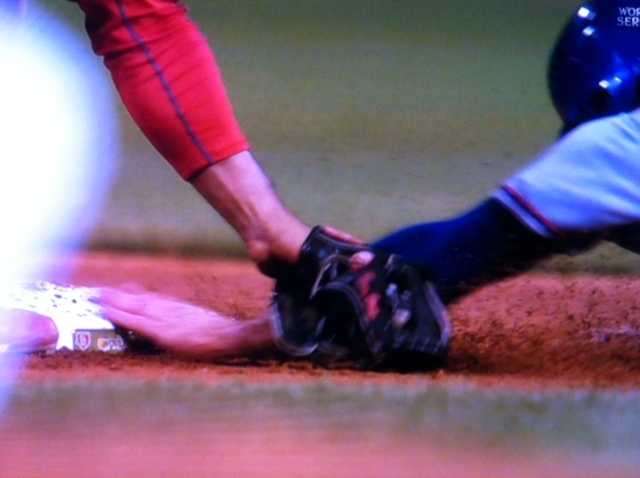 This World Series classic entered the 9th inning where the Rangers had to put everything on the line, down 1-0. Where the Cardinals brought in their fireballing closer, (Motte) who threw nothing but heat, and we all knew it was coming. Where a leadoff man on board brought true tension to the hometown faithful, and then moments our hearts jumped by a bang-bang play resulting from a clutch stolen base by Ian Kinsler. (And a stand up clutch call by umpire Ron Kulpa who showed why he is officiating in the Fall Classic. A great call, and correct one at that). Kinsler's clutch steal in the 9th. Kulpa makes the right call. It was a game in which the slightest miscue could cost either team the game, and that occurred as Albert Pujols failed to field the Jon Jay cutoff throw, allowing Andrus to take an extra base in the ninth. Where Texas’ base path aggression forced the Cardinals into panic mode in the 9th. Extra bases were taken out of sure hustle, sacrifice flies looked bigger than ever in this matchup. Albert Pujols failed to catch the cut off throw from Jon Jay. 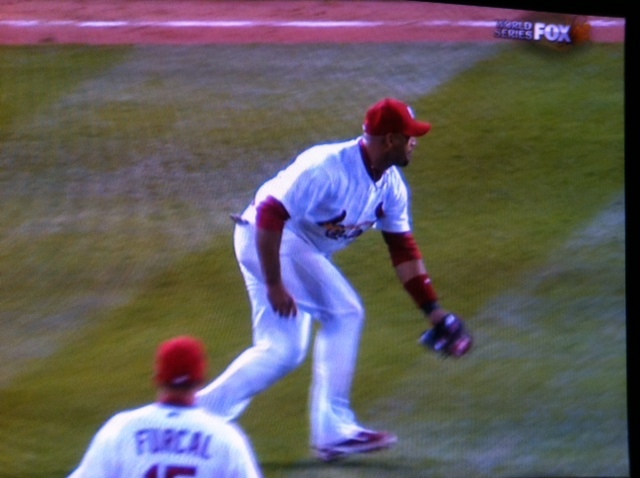 It cost the Cardinals a base and eventually was the difference in the game. Yes, it was good old country hardball. Something you’d expect out of the heartland of the nation. Pitchers heaving it with all their might. Runners advancing on the base paths on every opportunity. Defenders putting their bodies on the line to make plays that usually aren’t made. It’s all on the line and for some of these guys, its the only time in their entire lives that everything is on the line. What a great game! This has the makings of a great series. Now if only they could ban the Designated Hitter for the remainder. 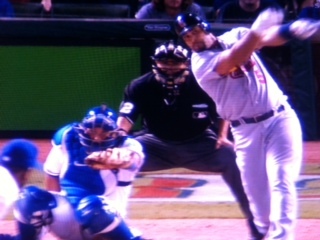 Unbelieveable, Nick Punto bunting in that final at bat in the ninth. Stupid move by LaRussa. How was he going to lay down a bunt against Felix's rising 98 MPH fastball on this bitter cold night? A wasted out and crucial mistake. On today’s Mason and Ireland show on ESPN radio, Dodger Manager Don Mattingly was as honest as I ever remember a baseball manager to be. He let us know that the Dodgers need a big bat to accompany Kemp in the lineup AND then he expressed doubt that the Dodgers will be able to get a big bat. He speaks in reality and doesn’t mince words. No fluff, no misleading of anyone. He simply told it like it is. The news isn’t surprising at all. What is surprising is how candid Don was. I can’t ever remember a person in a position such as Mattingly ever being so honest with what can perceived as negative news. Full audioof the interview found at THIS LINK (starting at 7:43 minutes into the recording). I honestly don’t know what to make of the recent Frank and Jamie McCourt divorce settlement terms that were announced today. I don’t know if it is good or bad news. I can’t seem to wrap my head around it and figure out if this means that Frank is going to lose the team or if this saved his skin. Is he dependent on the TV money to pay off his wife? Is he counting on the settlement money that he expects to collect in the malpractice suit he filed against his former law firm to pay part or most of Jamie’s $130 million? Will MLB be able to keep him from giving any of the future possible TV contract money to her? Is he counting on a minority partner to jump in and save him? If that is the case, then the real question to ask on that front is who in their right mind would ever want to join in a partnership with Frank McCourt knowing his past history? This whole situation is a tangled web so twisted and confusing that it is hard to tell up from down in my mind. In the off-season we should be talking about free agents like Prince Fielder and Albert Pujols, contract extensions for Kemp and Kershaw, trade rumors involving the possibility of dealing Ethier, discussions about re-signing Kuroda, Loney, Carroll, and Arizona Fall League prospect development. 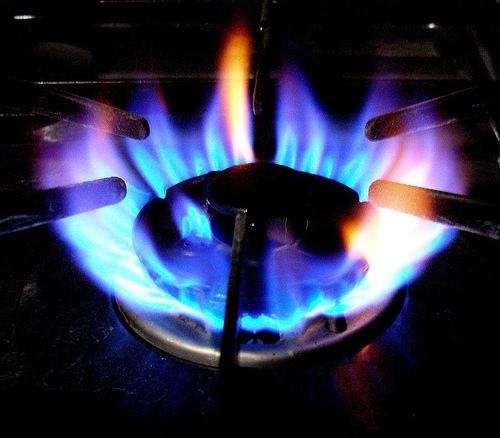 Instead, for the third consecutive off-season, the hot stove has the McCourts brewing on it. So I read the blogs. I read opinions of legal experts and of intelligent fans that have been following this saga now for years. I try to grasp an understanding of all the variables and realize, there are simply too many. I consider myself an educated man, someone that understands complicated situations and is able to unravel mind twisting jigsaw puzzle sized problems. But this is different. This is a total mess and worst of all, I’m tired of this mess. It’s a 25,000 piece jigsaw puzzle of a natural landscape that has about 12,000 pieces of bright blue sky. “Why bother with it?” I think, “there are more important things to do.” The completion just seems so far off. No end ever seems to be in sight. That’s the way Frank McCourt has lived his life. One legal issue after another, and when he doesn’t get his way, he just appeals and appeals. How many times have his rivals simply given up. Frank prevails in court not out of principle, but out of perseverance. He’s got to be the most patient man alive. Never mind that he is the most despised man in Los Angeles. He doesn’t care, as long as he continues to clutch the reigns of Dodger ownership. When the nuclear holocaust hits and the world is obliterated. Two things will emerge, cockroaches and Frank McCourt. How appropriate. Greetings from El Salvador where I have just finished up my week of work and will soon be boarding a plane for the U.S. again. 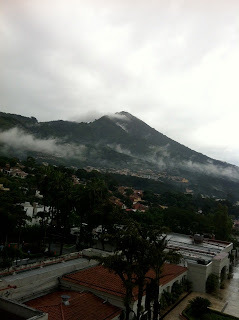 Unfortunately, work kept me very busy and torrential rain storms didn't allow me to go out and sight see. Tonight I was able to see that late innings of St.Louis' win over the Brewers. I just shake my head at how far the Cardinals have come. We cleaned their clock with a 3 game sweep in St. Louis in late August. I actually remember thinking that I kind of felt sorry for Furcal, who was traded to the Gateway the the West, only to see them fall far short of the playoffs. When the Dodgers left St. Louis on August 24th, the Cards were 10 games out for a playoff spot and they looked dead in the water. Now they are one game away from the Fall Classic. If only the Dodgers had made some moves earlier and played more of the kids early on, could we possibly be looking at a Dodger team in their position? As I look over the blog roll and review recent postings from my favorite blogs, its easy to note that these days are relatively weak with regard to Dodger news, but I am thinking more and more about heading to the Southland on November 5th for the Frank and Sons 1981 Dodger World Series reunion event. What a fantastic opportunity to meet so many from the World Championship team. If you are willing to break the bank, you can walk away with some treasured items of Dodger Memorabilia. It is near midnight here and I have a 4:30 am wake up call in order to catch a shuttle to the airport for my early morning flight, so I'll close up. A Ranger-Cardinal World Series looks to be quite probable. I never saw that come last April. 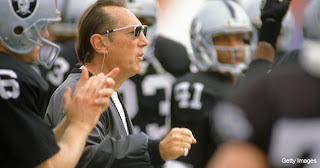 I was very sorry to hear of the passing of Al Davis. The death of Raiders owner brought back a distant memory to me. I was actually fortunate enough to meet him once, even if it was only five or six minutes. I really didn’t expect it to happen, but the pieces just seemed to fall into place. Here’s my story. In 1985, I was working for an insurance company, doing workers compensation audits. It was a job I got through my brother and it was almost perfect, because able to schedule appointments between my 16 units of classes I was taking at Cal State L.A. The San Diego based insurance company would mail me my work, and I’d set up appointments on my own, throughout the southland. I was thrilled to receive a packet for one of our policyholders, the Los Angeles Raiders. I checked my schedule and set up an appointment. The Raiders offices were at a renovated elementary school in El Segundo that had been converted into their corporate offices along with practice fields and training facilities. The appointment was for early in the season. I believe it was sometime in September. When I arrived at my mid morning appointment, I found the place to be jumping. There was a receptionist in the hallway. I couldn’t really call it a reception area. It was literally a hallway that the kids used to walk through to get to their classes in years past. The players were all over the place. Slapping hands, joking around. I really didn’t recognize anyone until Marcus Allen walked by as he approached and embraced one of his teammates. I was sitting there waiting for the comptroller to come down and show me to where the records were and Lyle Alzado passed by, and Tom Flores too. Eventually the comptroller, Peggy arrived. She took me up into a film room and the table was set up with all the ledgers available for my perusal. She said that Mr. Davis might drop by, because he had some questions for me. Now that, i didn't expect. I was in my early 20s and didn’t have a lot of knowledge in the workers compensation policy rules. I simply knew what I needed to look for in the ledgers and the thought of Davis dropping in on me and hammering me about workers comp rates and his premium, I found a bit intimidating. Davis at the time was knee deep in litigation against the NFL and he was known to be a tough negotiator and winner when it came to legal issues. “You bet I am, Mr. Davis. Congratulations on the Super Bowl win,” I said. He then turned to business, “I was going to ask you about that, he said. “There are super bowl bonuses added on to the players payroll, are those bonuses subject to premium calculations?” I knew the answer, “Yes, Mr. Davis, I’m sorry to say that they are.” I showed him the California Workers Comp manual and the reference to bonuses. He frowned and then looked up and said, “Well, you can’t blame me for trying to save a little money, can you? Winning the Super Bowl was worth it.” Then he broke out in a laugh and told me to make sure that Peggy provide a tour for me before I left. “Of course, sir,” I said. He then left. Now if Lyle Alzado had burst into the room, demanding to see the books, I’m not sure if I could have held him off, but that didn’t happen of course. I completed my work, didn't ask for the tour, I just left and that evening summarized the audit and sent it in to the corporate offices. Two weeks later I received an envelope in the mail that had been sent to the insurance company offices, it was addressed to me. Surprised, I wondered why I was getting such a large envelope from corporate that was as light as a feather. I usually got big packets of work from them. To my surprise it contained two 8 X 10 autographed photos of Marc Wilson and Todd Christensen. “Evan, Life is kismet!” wrote Christensen. I went to the dictionary to look up what that meant...typical Christensen. Al Davis, took the time to make sure that this kid auditor, who was a little bit of a fan, received a few mementos from the visit. I thought that was quite extraordinary, considering all the things Davis had on his plate and the fact that they were the defending World Champs. 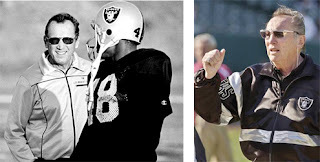 For that reason, despite all the lawsuits, treatment of Marcus Allen, numerous coaching changes and stubborn ways, I still have always thought Al Davis was a class act. He treated me with respect. A man that was somewhat a recluse, was very open and friendly to me. A small blurb from the Chicago Tribune in 1987, a year before Gibson was a Dodger. 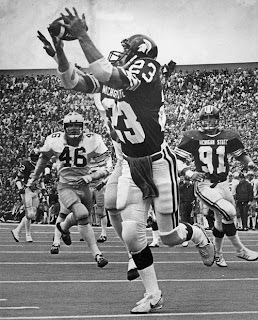 Detroit Tigers outfielder Kirk Gibson, a onetime Michigan State wide receiver, told the Detroit News that he was contacted earlier this month about playing pro football for the Los Angeles Raiders. 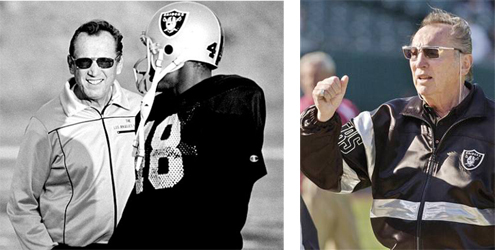 ``A guy came up to me and said he was (Raiders owner) Al Davis` right-hand man,`` Gibson said. `` `Want to play football?` he said. `Are you serious?` I said. Two days later, I saw they signed Bo Jackson.`` Gibson said he was was intrigued by the thought of playing football again, but added: ``No way, not for another year at least.`` His contract with the Tigers runs through 1988 and prohibits him from pursuing other sports. American Football League (AFL) Commissioner Al Davis meets at Dodger Stadium with Walter O’Malley. Davis had been named AFL Commissioner two months earlier. Mel Durslag of the Herald Examiner wrote about the meeting two years later saying that the purpose of it was Davis’ intent to expand the AFL to Los Angeles and have a team play their games at Dodger Stadium. In order to impress O’Malley, Davis rented a limo and chauffeur in an effort to leave a lasting impression of the AFL’s emergence as a power player in sports. Al Davis is said to have always admired O’Malley for his vision and guts. Roger Abrams in his book Sports Justice said that Davis viewed Walter O’Malley as one of his role models. Davis, a fellow Brooklynite, probably had a lot to say in his sales pitch to Walter. I wish someone had taken notes of that meeting. Of course, nothing came of it, as the AFL merged with the NFL within a few years and it wasn’t until years later that Davis moved his Raiders to Los Angeles as O’Malley had done so many years before. Interestingly, twenty-nine years after Al Davis and Walter O’Malley met in 1966 regarding an AFL expansion team playing at Dodger Stadium, rumors surfaced that his Raiders might play at Dodger Stadium when the Coliseum Commission was not working with him. It was probably posturing on Davis' part to get a better deal as we know eventually, the Raiders returned back to Oakland where they continue to play today. He was the infield position converter guru. 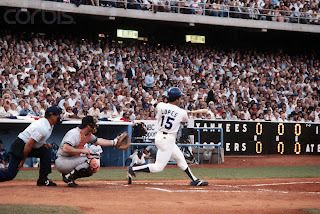 The guy that made catcher’s into second basemen (Ted SIzemore), third basemen into 1st sackers (Garvey), outfielders into middle infielders (Lopes and Russell). Two rookies of the year gave the credit for their development to the little known instructor, scout and coach (Lefevbre and Sizemore). He spent hour after hour smacking grounders to those guys. Very few knew how to teach infield footwork better than him. His legacy lives on as Davey Lopes continues to teach much of his philosophy to the present day players. Romanus “Monty” Basgall was a native of Pfeifer, Kansas. 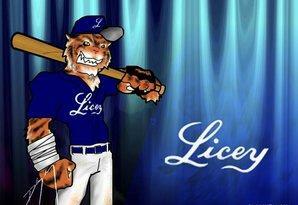 Born in 1922, baseball was in his blood and his dream was fulfilled when he was signed by the Brooklyn Dodgers in 1942. Shortly afterword, World War II disrupted his baseball career for three seasons. He returned to the game he loved in 1946 only to be traded to the Pirates organization following the 1947 season. It was there that he worked his way up to the big leagues. 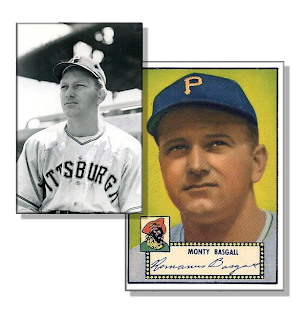 Monty spent two years with the Pirates as a light hitting second baseman batting, (.216 and .218 in 1948-49), before returning to the minors in 1950 in favor of second baseman Danny Murtaugh, of future Pirate managerial fame. In 1951, Basgall was called up to the majors again, but his .209 average doomed him to the minors, this time for the remainder of his playing career, which lasted another seven years. Monty is remembered for his time in Southern California as a player with the Hollywood Stars at Gilmore Field from 1952-54. He concluded his playing career as a player manager in Waco, Beaumont and Lincoln from 1956-58. Recognized as a savvy young baseball man, Dodger G.M. Buzzie Bavasi hired him as a Dodger scout in 1959. He worked in that capacity for the next 12 years with off and on stints as a Dodger minor league instructor and within the minor league coaching ranks. While a scout, one of his signings in 1966 was of a raw athlete from Pittsburg Kansas that only played basketball in high school. He was from a school so small, it didn’t even have a baseball team. 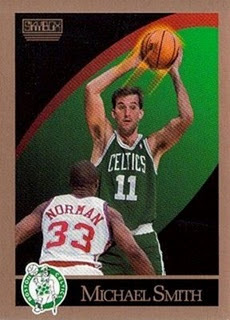 That young signee, Bill Russell, would be instrumental in the development of Basgall’s career for the next 20 years. Interestingly, their careers intertwined until Monty finally retired from the game in 1986. 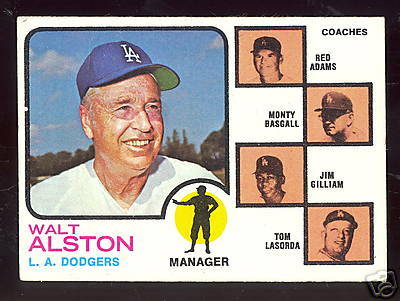 Monty Basgall managed Dodger farm teams in El Paso and Albuquerque in the early 70’s, but his ascendency to the Dodger coaching staff came directly out of his ability to convert key players to infield positions, a talent that few had ever succeeded at before. Ted Sizemore was the first successful conversion. 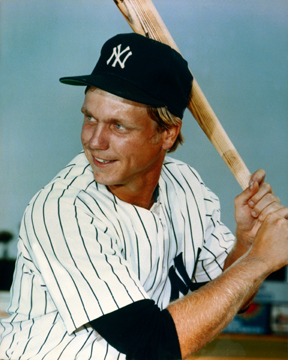 Moving from catcher to second baseman, primarily through the tutelage of Basgall in 1968. By 1969, Sizemore won the starting second base job and more than held his own as a full time major league second baseman, winning the Rookie of the Year award. That success encouraged the organization to do the same with Basgall’s signee, sleek fielding outfielder Bill Russell. Russell was a fine hitter but lacked pop and shortstop seemed to be the ideal spot for him. An aging Maury Wills started the first 12 games in 1972 going 4 for 47 (.106), and Russell took over the position. 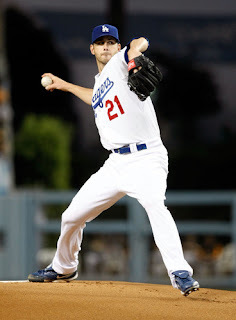 It was a difficult chore to ask of anyone changing positions, but the 23 year old youngster was replacing a popular Dodger legend who wasn’t about to help the guy that was going to force him into retirement. 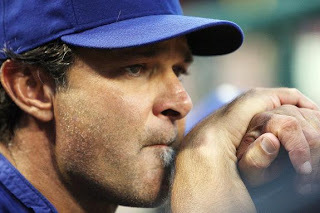 Russell, was on his way to committing 34 errors at his new position as he was learning it on the fly in the majors, was dealing with a lot of stress and a booing fan base. Basgall started the year managing the first 62 games for the AA Texas League El Paso Dodgers when Dodger management decided to call him up to the big club to work full time with the struggling Russell. What Monty was able to accomplish was to provide a confidence and a calming influence that helped the youngster settle down and finish the year off solidly. Monty was Tommy Lasorda’s bench coach for much of the early Lasorda years. 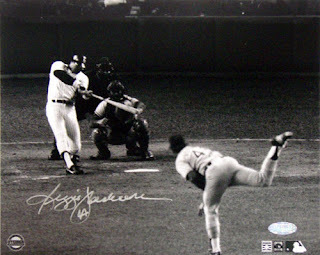 A loyal Dodger to both Alston and Lasorda, Basgall was called upon to solve Steve Sax of the yips in 1983 when he routinely threw souveneirs to fans behind the first base dugout. Again, Basgall was the calming influence, unlike Lasorda, who was tearing his hair out over the troubles of young Sax. With four pennants, six division titles and one World Championship as a coach from 73-86, Monty announced he was calling it quits when Bill Russell retired following the 1986 season. And who replaced Basgall’s spot on the Dodger coaching staff? Monty’s successful student, Bill Russell himself. Lasorda leaned on Basgall for strategy, and was mainly responsible for filling out the lineup, being Tommy’s closest advisor amongst his coaching staff. 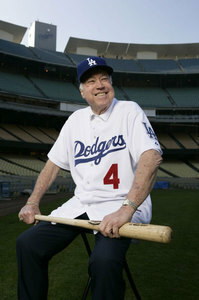 But Basgall's charm, voice of reason and poise served the high strung Lasorda well. 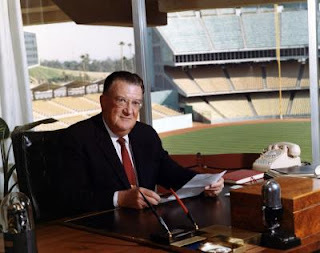 As the architect to the Dodger infield that had an eight year run, very few realized the blueprint that Basgall put in place and his major influence on the organization. As the 1987 season was about to begin without Basgall, he said, “Tommy’s been doing this for 10 years now and the longer you’re in the business, the more confident you get. Tommy is the kind of guy that relies a lot on his coaches, which is great. Alston was the same way." 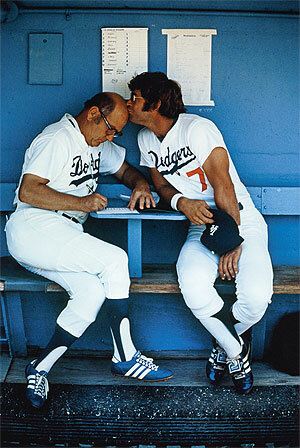 "Monty (Basgall) wore the Dodger uniform with pride, dignity and character. 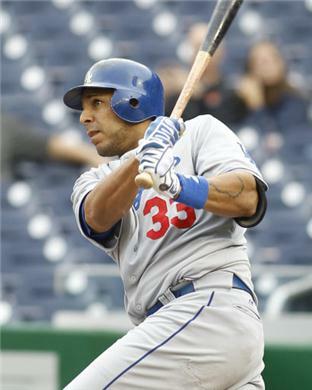 He signed his first professional contract with the Dodgers, but played most of his career with the Pirates. 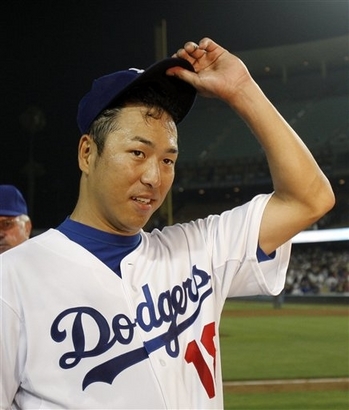 However, he served many different roles in the Dodger organization. He was a scout, a minor league instructor, a major league instructor and my bench coach; he was my right-hand man. His tremendous knowledge of the game was a true help to me, and I will be forever thankful for his help in the dugout. Monty was the epitome of what it means to be a Dodger. He was a man of integrity, he loved the game and he was a champion both on and off the field. His example is one we can all learn from. His contributions to the game and to our organization, are endless."